Backyard chicken keeping is no longer a rural relic from the days of your grandparents. Chickens are easy to raise, and have the added bonus of not being picky about their digs. With some cast-off wooden pallets and a few tools and supplies, you can easily create a coop on the cheap. 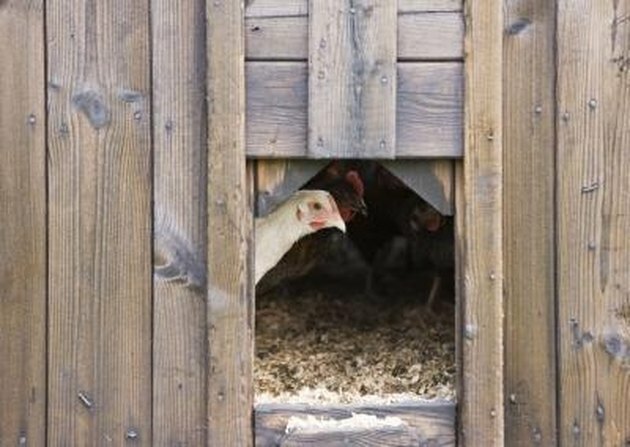 Wood pallets are abundant and often free, and turning them into a chicken house is a great way to recycle items that usually end up in a landfill. Lay one pallet on the ground for the floor of the coop. Choose a flat surface, or use sand or gravel to level the area if necessary. If possible, the area should be free from standing water or low spots where water can accumulate. Most pallets are 4 feet by 4 feet; using pallets that are all the same size will make construction easier. Place three 4-by-4-foot pallets, one at a time, upright on top of the floor pallet to form the three walls. Place the wall pallets even with the outside edge of the floor pallet. Nail the bottom of each wall pallet to the floor pallet, using three to five nails. Also nail the wall pallets to each other at the top and middle, again using three to five nails. Take a pallet apart using the hammer and crowbar. Pry the flat boards off the 2-by-4 pieces of the pallet; this may be tedious, as pallets are usually fastened with spiral nails. This will be for the coop door; it will be 4 feet by 4 feet, or the same size as the open side of the coop. Lay two 2-by-4 wood pieces on the ground, parallel with each other and about 3 feet apart. One 2-by-4 will be at the top of the door, and the other will be at the bottom. Next, place the flat boards across the 2-by-4s, perpendicular and fitted closely together. The ends of these boards should overlap the top and bottom 2-by-4s by 6 inches. Nail the flat boards to the 2-by-4 pieces with two nails at each end. Attach the door handle to the 2-by-4 side of the door. Lay the door on the ground with the 2-by-4 side facing up. Place one hinge on the edge of the top 2-by-4 so that one plate of the hinge lies flat on the board and the center pin is tight to the 2-by-4. Screw this half of the hinge to the 2-by-4; do the same on the bottom 2-by-4 with the second hinge. Place the door in the opening to the coop. Screw the other hinge plates to the wall pallet in the same way they were attached to the door. If necessary, nail a 2-by-4 piece to the pallet wall first so the hinges can be attached there securely. To be sure there is about 1/2 inch of clearance space between the bottom of the door and the floor pallet, set a thin pallet board under the door while attaching the hinges to the wall. Mount lock to door. Take apart several more pallets with the hammer and crowbar and use the flat boards to cover the coop floor and for siding on the outer walls. Use the circular saw to cut boards to match the width of the floor and walls, if necessary. Fit boards tightly together and nail in place, using two to three nails per board. Nail a 2-by-4, wide side parallel with the floor, across the back wall of the coop. It should be halfway up the wall of the coop and 1 foot away from the back wall. This will be the chickens' perch. Place the plywood or sheet metal on top of the coop; attach the top piece to the walls with nails every 12 inches. This will be the flat roof of the coop. The roof piece should be large enough to overlap each wall about 6 inches. Paint the inside and outside of the coop with exterior paint. This will seal the wood and prolong the life of the coop. Amy Schauland has been writing professionally about organic gardening for eHow Home & Garden since 2010. She caught the writing/editing bug in a high school creative writing class in 1998. Amy graduated from University of Wisconsin-Stevens Point with a bachelor's degree in psychology.